In purse seining a school of fish is gradually encircled by a long wall of netting, possibly as long as 1 Km, hanging in the water and towed into a circle. Once the circle is complete, the net is drawn together like a draw-string bag, constraining the fish. The fish are then hauled aboard within the net, pumped to the deck, or scooped into smaller brail nets and lifted aboard. Artists conception of purse seining operations. Fish are likely to experience fear as they try to out-swim the net moving towards them, and as they are finally encircled. Sometimes fish are deliberately scared by, for example, high speed chase boats used to herd the fish. Once the circle is complete, the trapped fish are confined in a shrinking space of water and become increasingly crowded. At a certain point, the constriction of space will prevent the fish from swimming as a school, when instead they will move as individuals. This is likely to be very stressful, and fish are liable to incur injury and scale loss from collisions with other fish and with the net walls. Stress levels of sardine caught in purse seines have been observed to be similar to peak levels reported elsewhere for acute distress, according to one study. The same study found that stress levels continued to increase the longer the fish remained in the net. Chilean jack mackerel caught in a purse seine. Fish can also receive further injury as they are transferred to the fishing vessel. Pumps can break fins and damage scales. 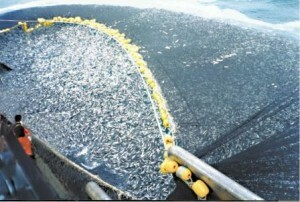 In ramping, the seine net is hauled aboard en mass, causing fish to get crushed. In brailing, fish are transferred using a smaller brail net. Lower death rates and lower levels of “physiological disruption” have been found in salmon transferred by this method as compared with ramping. 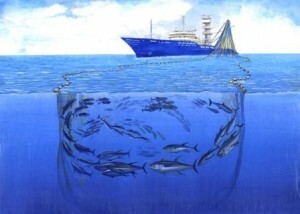 Sometimes purse seine nets are deliberately set on dolphins, in order to catch tuna that swim with them. However, the alternative of setting nets on fish aggregating devices (FADs) produces much greater numbers of bycatch animals, mainly fish (see environmental justice foundation website). Environmental groups such as Greenpeace (see greenpeace FAD campaign) and WWF therefore support a cleaner method of fishing, monitored by an observer programme, which sets on dolphins but allows them to escape before the net is hauled in. Bycatch is less of a problem when seine nets are just set on a free-swimming school of fish, rather than on dolphins or FADS. Sometimes part of the catch (i.e. excess catch) is deliberately released from the tightened net instead of landing it, in a process called “slipping”. Despite the fact that these fish are released alive, high death rates can occur following release as a result of injury and scale damage incurred. Possible ways to reduce these wasteful death rates are for fish to be released before the net is tightened and reducing the practice altogether.